Gazette’s Introductory Note. The following short article from UVSciences.com gives a very general view of some alternative uses of ultraviolet in water treatment. UV is widely accepted as a method of water disinfection, but it is not so widely known as a treatment for TOC (Total Organic Carbon) and the reduction of chlorine and chloramine. The article does not explain that these special uses require special equipment and the regular 254 nanometer low pressure lamps that are used for destruction of bacteria and viruses cannot simply be applied to the treatment of TOC or chlorine/chloramine. 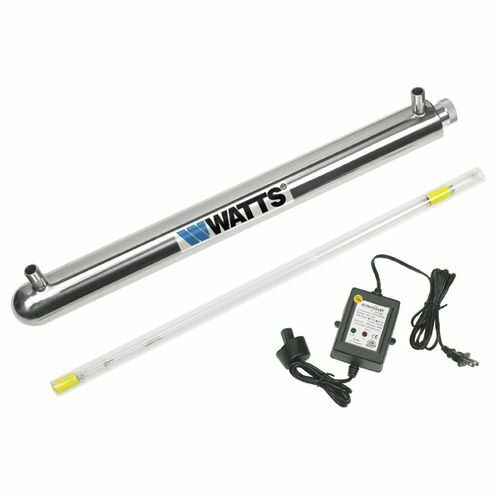 Each of these requires specific wave lengths and chloramine reduction is done with a medium pressure lamp. At present chloramine reduction with UV is mainly used for swimming pools, but other uses are being developed.–Gene Franks. Chlorine and chloramine are used extensively for water disinfection. These compounds, and related byproducts, such as trihalomethanes (THM’s), are often present in water supplies. These compounds must frequently be removed because they are potential health hazards, and they may affect the taste of consumable products, such as flavored beverages and bottled water. Removal is also necessary because chlorine and chloramine based compounds can significantly increase the operational/maintenance costs for purification equipment, such as ion-exchange beds and reverse osmosis (RO) membranes, all used for ultrapure water processing. UV is becoming more popular for destroying chlorine/chloramine compounds as the performance of UV lamps improves and the costs associated with traditional methods of removal become prohibitive. The mechanism used by UV to destroy chlorine/chloramine compounds is dissociation. The ultraviolet energy “breaks” the molecular bonds of the compounds reducing them to their basic elements. These basic elements will either combine with others to form benign compounds, or they can be subsequently removed in a downstream purification process. Traditional methods for removing chlorine/chloramine are Granular Activated Carbon (GAC) filter beds, or chemical injection using sodium metabisulfite. Sodium metabisulfite can introduce undesirable byproducts into the water supply and it can create favorable conditions for microbial growth in RO membranes downstream. Sodium metabisulfite is also a potential health hazard that requires protected storage and careful handling. Activated carbon beds used for chlorine/chloramine removal are susceptible to microbial proliferation, and they are vulnerable to “break-through”. As a result, it is necessary to inspect, clean, and replace activated carbon beds regularly, which requires costly downtime on manufacturing lines. Case studies have shown that UV treatment prior to activated carbon beds and reverse osmosis membranes will reduce overall operating costs by increasing the time between cleaning cycles, and extending the life of both GAC beds and RO membranes. Ultraviolet treatment also provides additional benefits in the form of disinfection and TOC reduction, without affecting taste and without the creation of difficult to remove residuals.